Established in 1919, in the wake of World War One, Germany’s Bauhaus art school brought a radical new approach to design and aesthetics which would eventually go on to help inform modernist architecture around the world, and in its centenary year, the BBC has looked at a selection of some of the buildings shaped by that influential school. The Bauhaus was founded in Weimar by Prussian architect Walter Gropius (1883-1969). While Bauhaus translates as ‘building house’, Gropius didn’t want to build only houses; instead, he wanted to create artists who could turn their hands to anything. Students were taught pottery, printmaking, bookbinding, carpentry, typography and advertising. They were encouraged to look at the world around them in a new way, studying in hands-on workshops that were the opposite of the stuffy and elitist lectures of many contemporary design schools. 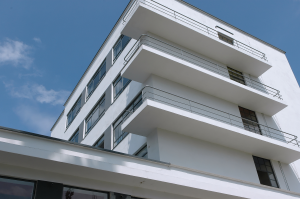 In 1925, the Bauhaus relocated to the city of Dessau, where Gropius designed a new base for the school. With a steel frame structure and large walls of glass, the building featured many characteristics of modernist architecture. The Bauhaus aesthetic combined form, function and efficiency and soon became evident in buildings around Germany. Gropius left the Bauhaus in 1928 and was replaced as director by Hannes Meyer. With German politics polarising, Meyer soon stood down and was replaced by architect Ludwig Mies van der Rohe (1886-1969), who began placing greater emphasis on architectural design. As support for the Nazis grew, the school began to be seen as being at odds with National Socialism and students and teachers fled to a new base in Berlin. When Adolf Hitler became chancellor in 1933, the school was closed down. Driven into exile, many key figures of the Bauhaus emigrated to countries such as the US and Israel, where their philosophies inspired generations of architects and designers. One hundred years later, the austere, modernist influence of Gropius and his cohort can continue to be seen in buildings around the world. The 100 Years of Bauhaus festival runs from 16 to 24 January 2019 at the Berlin Academy of the Arts in Germany.